Alex Tanguay and Scott Hannan sustained injuries in the Flames battle with the Minnesota Wild but head coach Brent Sutter confirmed both veterans will play tonight against the Nashville Predators. After a solid performance in their 5-2 victory over the Wild on Sunday night, the Flames are looking to put together back-to-back wins for the first time since late October. "We're just working on two in a row. Not look at the big picture, not look how many teams are above us or whatever," said Jarome Iginla. "We've just got to start with two in a row. "Pretty much every team has had a string and put three, four, five wins together. We haven't yet this year so we believe ours is coming." The Flames have been notorious for being stuck in a win one, lose one cycle and their offensive production has been just as up and down. Sutter threw his forward lines into the blender prior to Sunday's game in hopes of generating more offence and the experiment paid off. The bench boss will ice the same lines tonight against the Predators. The top line - comprised of Iginla, Olli Jokinen and Curtis Glencross - were particularly effective in the win, notching three points, and Glencross feels he and his linemates are on the cusp of an offensive outburst. 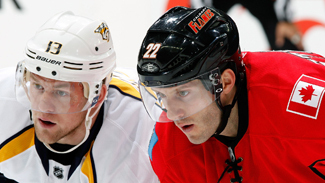 "We've just got to keep it more consistent," Glencross said. "Work hard, skate and we're going to get scoring chances." Forward Blake Comeau will play his first game as a Flame in the Saddledome tonight and the Meadow Lake, SK native will have plenty of support in the stands. His parents now reside in Calgary and he has several other family members spread out across the province. "There will be butterflies, but a lot of excitement. I haven't played in front of my family that often," Comeau said. "It's fun to think about, having the family around." The winger was claimed off of waivers by the Flames on Nov. 25. He flew in that afternoon and played that evening against the St. Louis Blues. Despite the chaos on the day he was acquired, the transition has gone relatively smoothly for the 25 year-old. "(I'm) coming to a team that seems like they want me here and I want to be here. So it's a nice mix. I'm just trying to get accustomed to everything as fast as possible and try to fit in. Try to help out as much as a I can."